The Time War will forever remain one of the defining events within the Doctor Who universe, actions in the classic series setting the scene for the ultimate confrontation between the Time Lords and the Daleks and events in the modern series dealing with the fallout both for the Doctor and for the universe at large. In a sense, having the Time War occur off-screen was a masterful decision in terms of building the character of the Doctor from Christopher Eccleston’s portrayal onward and letting the series reinvent itself without being tied explicitly to previous continuity, but that choice also left a glaring hole in the franchise’s overall mythology that short accounts could never fully explore. With the surprising introduction of John Hurt for the fiftieth anniversary special as an incarnation of the Doctor who had forsaken his name because of his wartime actions, the first glimmers of the actual fighting were offered, opening the door for further adventures with this mysterious figure in Big Finish’s own The War Doctor run of series. But as ‘The Night of the Doctor’ made clear, Paul McGann’s Eighth Doctor was also reluctantly involved in the Time War despite his best attempts to avoid it, and now his involvement is allowed more thorough exploration with a sixteen-story epic of his own beginning with The Time War 1. John Dorney’s ‘The Starship of Theseus’ opens events, finding the Doctor and his companion, Sheena, ready to enjoy a holiday when they land aboard the titular luxury space-liner just as it’s about to leave the Jupiter spaceport. Refreshingly, the disappearance of passengers and the presence of mysterious creatures demanding an ominous toll at a hyperspace bridge sets the scene for a rather traditional tale, and the Doctor seems calm and almost exuberant to start an adventure afresh with no known ramifications after so many interlinked and weighty stories in both the Dark Eyes and the Doom Coalition sagas. However, the ship and circumstances strangely warp around the duo and they soon find themselves instead suddenly on a refugee ship fleeing the fringes of the Time War itself, amplifying the threat and danger immensely and providing the perfect entry point to the Doctor who has not yet even considered committing to fighting. It seems clear from the outset that the confusing temporospatial effects of the Time War will form a key component of this saga, and what seems like an established and natural Doctor-companion relationship is revealed to be anything but as neither the Doctor nor Olivia Vinall’s Sheena remember meeting each other or how they came to be upon the ship. With a pre-credits sequence showing just how ruthless the Time Lords have become in this time of war and the Doctor’s new surroundings then revealing themselves in short order as he tries to piece together the fluctuations around him, the tone is quickly set for a dark and emotional exploration of the Doctor as he struggles to remain a pacifist onlooker as everyone around him becomes more afraid and more aggressive and not even Sheena (or perhaps Emma or Louise) proves to be safe from the ravages of war. Indeed, with an appearance first by a critically injured Time Lord who is seeking to fulfill his mission by finding the renegade who refuses to fight and then by the Daleks themselves who make a bombastic entrance where no action or death is off-limits during their own merciless hunt, it’s clear that The Time War epic will not shy away from showing the ensuing carnage and emotional turmoil that will invariably haunt the Doctor for the rest of his lives as the two sides continue to battle with little regard for the universe around them and the havoc that the resulting flux in timelines causes, an exciting proposition that presents plenty of storytelling opportunities going forward. 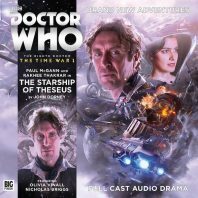 ‘The Starship of Theseus’ is an incredible introduction to the Time War for the Eighth Doctor and any listener unfamiliar with Big Finish’s other instalments set during this protracted tragedy, brazenly showing the fluidity of time and identities and taking no time to explain sudden changes in previously-stated facts as the past is rewritten and a new history is accepted. The gradual change in tone to sheer despair and despondent inevitability to mirror the Doctor’s realisation of his surroundings is superb, and Paul McGann more than rises to the occasion for this momentous release with one of his most understated but also profoundly emotional performances to date.